The materials used to create WARM AS A LAMBTM were tested for the required safety procedures. It has also been tested and found to be non-toxic as defined by the federal hazardous substances act regulations, title 16, code of federal regulations, Section 1500.3. 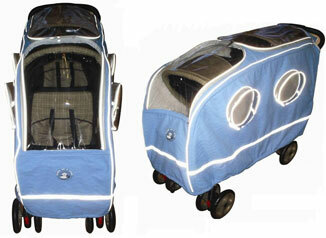 It is also flame retardant as it has been tested and is in compliance with the Federal Motor Vehicle Safety Standard No. 302. 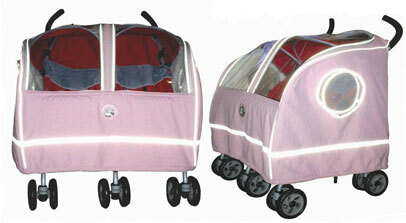 Our product is easy to attach to all strollers, including joggers. Before placing cover over the stroller, remove cup holders or any items attached on or across the handle bar. Once the cover is on the stroller you can re-attach all items removed. If you need the cover to be more fitted to your stroller, use the adjustable pulls located on the bottom edge of the cover. To create a front pouch effect, use the front adjustable pulls and go under the foot rest, then attach to the velcro holders under the cover. This will keep your child's feet from sticking out of the cover. Remove recordable voice module from the enclosed pouch underneath the top flap of cover. Then re-attach the detachable zippered front panel to protect the front clear vinyl window from cracking. Machine wash separately in a gentle cycle with a mild baby detergent in cold water and air dry. IMPORTANT NOTICE: ALL PLASTICS GET HARD AND CAN CRACK IF KEPT OUTSIDE IN THE FRIGID COLD. RE-ATTACH FRONT THERMAL PANEL IF OUTSIDE TEMPERATURE GETS BELOW 20 DEGREES FARENHEIT. DO NOT KEEP COVER ON STROLLER OUTSIDE IN THE COLD WITHOUT CHILD SITTING IN STROLLER AS THEIR IS NO INTERIOR HEAT BEING GENERATED AND CAN CAUSE PLASTIC TO GET HARD AND CRACK. CAUTION/REMINDER: THIS IS A WINTER STROLLER COAT COVER AND NOT INTENDED FOR USE DURING WARM WEATHER (ABOVE 63 DEGREES FARENHEIT) AND MUST BE REMOVED OR UNZIPPED IN FRONT PANEL FOR PROPER AIR FLOW.